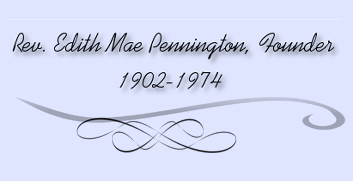 Edith Mae Pennington, the founder of The Plant of Renown, Inc., daughter of Arch and Julia Patterson, was born June 9, 1902, in Pine Bluff, Arkansas. She spent the early part of her life in Pine Bluff, Arkansas; went to Rice University in Houston, Texas and returned to Pine Bluff, Arkansas to become a school teacher. In 1921 The St. Louis Globe-Democrat, a leading newspaper in St. Louis, Missouri, conducted a national beauty contest. This was a contest that was conducted one year before the "Miss America" contest was established. 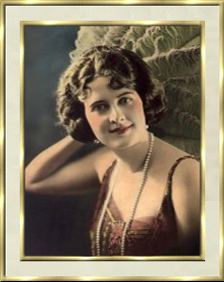 Miss Patterson's aunt, without her knowledge, entered a picture of her as a contestant. Seventy five photographs were received and viewed by selected judges: two famous artists, and a nationally known woman sculptress. The seventy-five were divided into districts: Missouri, Illinois, City of St. Louis and the United States. From this group she was chosen the "Grand Capital Prize Winner". Three prizes were awarded to each district. The first prize was $1000.00; the second prize $500.00 and the third $100.00. There was also a Grand Capital Prize Winner, who was to receive an additional $2500.00 with the accompanying title, "The Most Beautiful Girl in the United States", which Miss Patterson won also. Miss Patterson received a great volume of mail. Sums of money were offered to her to travel and make personal appearances, in theaters, at public gatherings, christenings, also receiving motion picture bids, etc. She made personal appearances in theaters as "an added attraction", having an act of her own. She visited one hundred one theaters in the period of one year. The social world lavished riches, honor, sensational applause, flattery; elite society welcomed her and she had much publicity. Mayors presented her with keys to their cities. She was the guest of various clubs such as Rotary, Kiwanis, Lions, etc. She was often made an honorary member and was entertained royally. She modeled street apparel, evening gowns and furs. Instead of being happy and satisfied with all of this attention she was receiving, instead, extremely disappointed. She became restless and tired of the fanfare and adulation, the bright lights of the stage and made a change. She decided to go to Los Angeles and Hollywood to make a career of the screen. In the company of her mother, her constant companion, she was received graciously in Hollywood. Her mother had trained her from childhood to keep her ideals high, her character untarnished and her reputation spotless. In Hollywood she found that many actresses lived stranger lives than the roles they portrayed on the screen. She was horrified by the obvious immorality on every side. To add to this disillusionment, she had several narrow escapes from those who planned her downfall. The presence of her mother saved her from this calamity. She finally came to the conclusion that an existence of luxury and momentary glamor was not what she really wanted from life. She wanted reality, something more tangible, more stable, more satisfying and enduring. At this point God began to deal definitely with her heart. He saw the intense longing in her soul and her need for Him in her life. He allowed the desire to increase and a hunger and thirst for him to grow deeper and stronger. All desire for the stage and screen left, and she began to read her Bible and earnestly seek God for guidance and direction. There came a parting of the ways. One road led to a career with fame and fortune, but there was sin, worldly pleasures, and a lost soul at the end. The other revealed the Cross of Jesus Christ, as Savior. Even though the Casting Director called repeatedly on the telephone, and sent many enticing letters requesting her presence to be cast in another picture, she held to her decision to forsake Hollywood and stardom. She was married in 1924 to her Business Manager, Jesse Battle Pennington. At a Pentecostal Holiness Church in Oklahoma City, Oklahoma in 1925, she made a surrender of her life to God. She often expressed this as an exchange from the glamour of the world for the glory of the Cross. At that time she pledged her irrevocable word to Christ to forsake all and follow Him. After her conversion, she received the Baptism of the Holy Spirit, with the evidence of speaking in other tongues and received a call to preach the gospel. Her message was "Jesus Christ and Him Crucified". On November 23, 1927, her daughter, Edith Lorraine Pennington, was born. Mrs. Pennington was licensed and ordained by the Assemblies of God denomination in 1929, and spent seven years on the evangelistic field both in the United States and in Canada. She came to Shreveport, La., in 1936 to hold a tent revival. She came back to Shreveport in 1937 for another revival, felt that God was leading her to establish a church, and became a Pastor. The Full Gospel Tabernacle was established in 1937. In 1943 the name was changed to The Full Gospel Temple. Services were held in several rental locations including private homes, a refurbished garage building on the corner of Cotten and Edwards Street in downtown Shreveport, in an office building at 3218 Line Avenue, the council chambers of the City of Shreveport, until four acres of property was purchased in 1945 at the corner of Line Avenue and Pierremont Road. A church building was built at this location and additional properties were purchased. Rev. Pennington pastored the church at this location until her death, May 16, 1974. Rev. 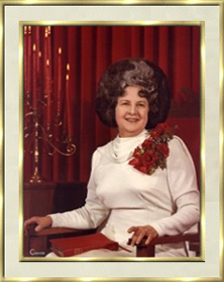 Pennington remained with the Assemblies of God until February 7, 1950 when God led her to form a new organization, "The Plant of Renown". This was an interdenominational organization with a "vision" for world-wide revival in the last days. Quote from Rev. Pennington: "I fully agree with Moses, the peerless adventurer of old, who stated that he had rather suffer with the ignoble slaves of his own race than to live a luxurious life in an Egyptian paradise. Therefore, I forsook the unimaginable spell of Hollywood sensation to walk, live, and preach to the meek of the earth". Copyright © 1998-2016 The Plant of Renown, Inc.